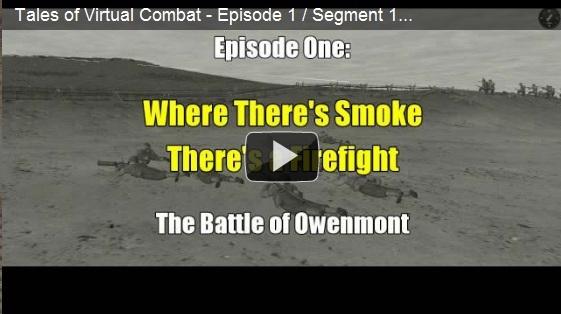 Patrick T. Ware has produced an amazing video, Tales of Virtual Combat: Where There’s Smoke There’s a Firefight. Using the game engine from Battlefront.com’s Combat Mission: Beyond Normandy, Patrick has created a virtual documentary of a WW2 tactical action. It is over two hours in length and broken into fifteen segments. If you have any interest in WW2 give this a look. It really is a creative piece of work. PROJECT DESCRIPTION & HISTORY: Tales of Virtual Combat (hereafter referred to as ToVC) is a derivative mockumentary born from the concept of an animated (13-26 week) documentary series that I originally intended as a proposal to certain cable television networks that specialize in world history programming. However, at the beginning of 2011, I reluctantly retired my full-service production company (of nearly a quarter century) prior to creating the pilot episode. The primary difference between the original concept and ToVC is the subject matter. Whereas the “series” was based on factual, untold — or even obscure — military engagements of interest (of which there are a multitude), ToVC is purely fictional story telling on my part, featuring “virtual combatants” in the place of animated renditions of actual flesh and blood participants. As a now semi-retired producer / filmmaker / screenwriter of some three decades, I found it difficult to simply leave this concept untested. That’s when coincidence intervened. I came across a unique proprietary 3D graphics engine (created by an independent software developer) that intrigued me. Their CMx2 engine was remarkably accurate in its history and extremely comprehensive in its presentation. Even though CMx2 is actually a PC game engine (or more accurately, a detailed battle simulator) rather than a CGI platform, I was still quite impressed by its graphical depth and control interface. Such features as its motion capture; simulated Newtonian physics; object and space displacement mapping and manipulation; and programmable AI prompted the “evolutionary” idea for ToVC. The premise behind ToVC’s creation was quite simple. Could I produce an animated program that resembles a television documentary series using a game engine exclusively (avoiding use of my CGI capabilities)? Could this be accomplished utilizing ONLY a high-end personal computer and a couple of basic multimedia tools freely available via the Internet? This was my motivation. The end result is the no frills, cinema-style, feature-length mockumentary now cued-up on your computer. You be the judge. This entry was posted in Computer Wargames, WW2, WW2 History.